Screening: Some Bright Morning film screening and conversation with Melvin Edwards and Lydie Diakhaté, in conjunction with the Melvin Edwards: Five Decades exhibition currently on view at Columbus Museum of Art, OH. In conjunction with the Melvin Edwards: Five Decades exhibition currently on view at Columbus Museum of Art, CMA and the Beeler Gallery at CCAD present a free conversation with Melvin Edwards and Lydie Diakhaté. The evening features a special premiere screening of Diakhaté’s documentary film Some Bright Morning: The Art of Melvin Edwards, which tells the global story of this renowned artist. Born in the segregated South in the 1930s, Edwards has created innovative, abstract welded-steel sculptures since the early 1960s. His work often incorporates found objects, and has frequently addressed social issues and racial violence. Following the artist from his New York gallery to both Ghana and Senegal, Some Bright Morning places Edwards’ life and work in an international context. The film explores his particularly strong connections with Africa, as well as how pan-Africanism and black internationalism inform his work. In extensive interviews, the artist discusses the cultural and political values that have enabled him to establish his own artistic language over the past five decades. The free conversation and screening will take place at CCAD in the Canzani Center Screening Room. 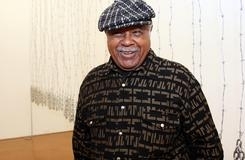 The exhibition Melvin Edwards: Five Decades is organized by the Nasher Sculpture Center, Dallas.